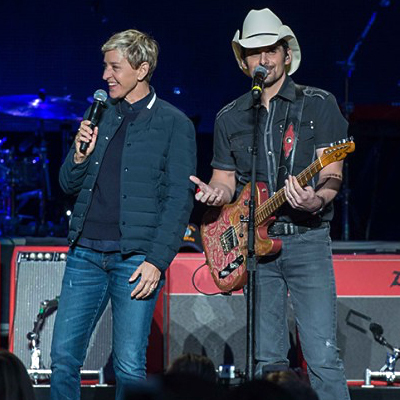 Country music superstar Brad Paisley hosted “The 2nd Responders” benefit concert this past Saturday evening at the Santa Barbara Bowl, in Santa Barbara, CA. Local resident and friend Ellen DeGeneres was special guest and welcomed the sold-out crowd with hilarious banter before she was joined onstage by Paisley. DeGeneres followed the Ventura City Firefighters Pipes and Drums band who opened the show by marching through the crowd and on to the stage, carrying on the tradition of bagpipes in the fire department by honoring fallen heroes and celebrating accomplishments of their comrades. Another local resident, 15 year old Lauren Cantin, performed a cover of Ed Sheeran’s song “I See Fire.” Lauren is a survivor of the mudslides and an inspiration to all. Santa Barbara and Montecito Fire Departments were also in attendance and joined Paisley for his encore. “The 2nd Responders” presented by Boot Barn and supported by ACM Lifting Lives, was in honor of those who were on the front lines, the first responders, at the recent southern California Thomas Fire, the largest wildfire in California’s modern history and the Montecito mudslides that soon followed. Paisley started the weekend of fun on Friday evening by posting on his social media that he would be at Scoop, a local gelato shop. Within minutes fans started arriving and Paisley treated all to gelato. The first of three surprise visits on Saturday began at a Santa Barbara comic store, Metro Comics, where he signed prints of his character scene on “South Park” and all monies raised went to local charity. As he left the comic store he tweeted he was going to French Press coffee shop and fans flocked there to be treated by Paisley. The third surprise of the day was after the main concert. He went directly to Old Kings Road, a British-style pub, and tended the bar while raising money for local charities. Sunday he was still at it by visiting the Red Kettle Coffee Shop in Summerland, CA. Sunday evening he performed at SOHO, a local restaurant and music club in Santa Barbara. He announced this show from the stage Saturday night and tickets were sold out within minutes – monies going to local charities. Proceeds from the concert and bar show will benefit the community and service workers through the following local organizations: Santa Barbara’s Farmers Market, SB Shine Campaign, Montecito YMCA, Restaurants Care, Unity Shoppe, Santa Barbara Bucket Brigade and Boys and Girls Club of Santa Barbara. The region was devastated earlier this year but has miraculously began revitalization and the majority of the businesses are back up and running – ready for visitors.